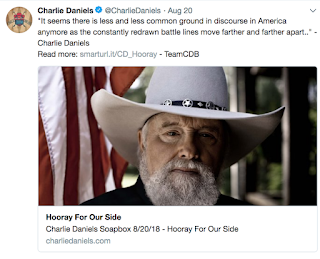 Why pick on Charlie Daniels? I’ve been a little tough on Charlie Daniels of the Charlie Daniels Band as of late and I wanted to explain why. Like Charlie, I grew up in Tennessee and remember hearing his music and thinking “this is different” and I liked it. Now I wasn’t a massive country music fan but “The Devil Went Down to Georgia” was a classic and back then, believe it or not, country musicians rarely used fiddles in their music (they used slide guitars and such). Charlie has always struck me over the years as Johnny Cash-like, in that he seemed to be going his own way, which I respect. But a little over a year ago I stumbled across a tweet Charlie on his twitter account and while I don’t recall what it said exactly word for word, I do remember it jarred me. As I scrolled further and uncovered his pattern of tweets I remember thinking maybe his twitter feed had been hacked. After it was clear it was apparently him making these remarks, I remember thinking and maybe even commenting, this man isn’t an artist, he’s not sowing peace and love with his music, he’s spewing negativity, fear, and division like a common cyber troll. Now twitter is full of people (and bots) spewing hateful diatribes but to see a successful (and presumably wealthy) musician essentially criticizing poor folks from other countries who come to the USA for a better life was, as I said jarring… and personal for reasons I’ll explain in a bit. But Charlie ain’t some backwoods cyber troll who hasn’t been anywhere, done anything or experienced life, this is a man who tours relentlessly and I’ll assume has left the country on more than one occasion. As a traveler, did he not experience, as I had, the incredible warmth and hospitality of some of the poorest folks on the planet? How could he, or anyone tweet the vile ignorance he was tweeting, if he had? And then the scripture and other inspirational messages he tweets, they run completely counter to the occasional divisive rant. Sure, Charlie has every right to his opinion and if he wishes to demonize people with different customs or more often simply with different political viewpoints (but still very much a patriot) that is his right. But then this week I received my Middle Tennessee State University alumni magazine which had an interesting article covering Charlie hosting an event to help U.S. Military vets, a very worthwhile cause Charlie has worked on relentlessly. I applaud him for that. I was thinking maybe I was wrong about Charlie so, let me see what he’s up to and I checked on Charlie’s twitter account again and after some very inspirational posts, saw this doozy of a tweet about an actual song he’d written that I’m sorry, it plainly smacks of Xenophobia. Here are the lyrics he posted. Now it may seem harmless on the 1st read through, but I can tell you with some degree of certainty and expertise that in ALL MY TRAVELS, no one has ever told me to “love it or leave it or go back to where I come from”. Quite the opposite, in fact, they’ve literally offered a free meal, a place to stay, etc. The hospitality from complete strangers in other places has always blown me away. Charlie is telling people from outside the USA that they must conform and not try to “change it” if they come here. Conforming is something you are forced to do in Cuba and other fascist regimes, not the USA. More likely, he’s watching his version of the U.S. slipping away and wants to hang on to it. I get it. But the reality is his version of the U.S. is a very narrow version that is only real to him in his world. It doesn’t match my version and my world and sorry but I’m as much of a citizen and patriot as Charlie. And by the way, my version doesn’t match 299,999 million other people who are as much of a citizen as both Charlie and me. So I wrote an email to the publishers of the MTSU Magazine, mostly with the intention of praising them on a fine product that seems to get better each issue, of which I was sincere. But I also took the opportunity to alert them about Charlie’s twitter account which contains tweets counter to the theory of the University’s premise of a welcoming place of learning for an increasingly international student body. Students from all over the world come to study at MTSU and I, for one, am very proud of that fact and of my University in general for its growth as such. Well, I’m not, or at least I don’t mean to be picking on Charlie. Charlie is old (82), and that fact sincerely didn’t occur to me until some folks wrote to me as I had never considered him as an old man. I haven’t seen him on TV in years, and like many celebrities, he was just kind of ageless in my mind, stuck in time, with a white beard, boots, wrangler jeans, perhaps some tobacco in his jaw and a fiddle in his hand with an almost Santa Clause like joviality when he played. The last thing I want to do is pick on an old man who reminds of Santa Clause… or anyone for that matter. Even in this graceless age, in my mind, only incompetent corporations, repugnant ideologies, etc. should be attacked, not individuals, unless they lead such nonsense or are being repugnant in their views. 2) Feel so very passionate about I simply can’t remain silent. – Intellectual Dishonesty is wrong. – Demonizing others to gain an advantage is wrong. – “Whataboutism” to justify your own wrongdoing is wrong. Charlie is from Tennessee and I’m from Tennessee and when he tweets out vile stuff he’s fulfilling a hateful stereotype that I’ve spent my entire life trying to live down. That’s why this is personal. The Tennesseeans I know are (mostly) a good bunch of folks who are like the folks in other countries where I visit, they will bend over backward to be hospitable and nice, politics be damned. But besides that, when Charlie or anyone, be it the Homeland Security folks at the airport or a random stranger on the street, treats a visitor badly then I feel it reflects poorly on me. That’s another reason it’s personal. How can I travel all over the world, absorbing the unconditional love and kindness of strangers while folks in my own home country are being nasty to visitors or newcomers here? I’m sorry but quoting scripture and wrapping yourself up in the flag doesn’t make you a good human being or even a good American. And writing blog posts about how bad the political discourse in this country has become is disingenuous and intellectually dishonest when you, yourself are actually driving and contributing to the problem. That’s called “hypocrisy” I believe? I’m not saying Charlie is a bad human being, on the contrary, he’s just a human being, which means he’s good, he’s bad, he like all of us has unique gifts, some good traits, and some deep flaws. Charlie Daniels has WAY more influence and sway than I do and it pains me to see him use it to divide, demonize and spew what frankly is ignorance, especially when I know better. As I said, when someone… anyone, mistreats a traveler or visitor, it’s personal to me. So, it occurred to me that while Charlie travels, he probably mostly just travels in the USA on tour with his band where people know and adore him. This man, I assume, has worked hard for what he’s achieved and has somehow been convinced if poor people immigrate to the USA (legally or illegally), it’s going to take away his livelihood and legacy? I don’t know, I’m not a mind reader but I’m trying to empathize and see where he’s coming from. So I thought, why not go on a trip with Charlie to somewhere they don’t know who he is? I could empathize and see where he’s coming from and he could empathize and see where others are coming from. We’ll go somewhere he can get treated like a normal human being, a normal traveler so he can see what I see when I travel. What kind of impact would that not have, not just on Charlie but on all his followers and fans? And if we filmed it, even better. I always said “no celebrities” but in this case, I’d happily make an exception and lest you think I’m just doing this to be self-serving, if he didn’t want a camera present, no problem there either… I love to travel without cameras, it is definitely more authentic. Bottom line, my offer to Charlie for him to travel with me (my treat) for just a few days to some.. any developing nation and get to know the farmers and regular working class folks could have a huge impact on him. He’s a champion of the working class, I think he’d love it and his tweets and his life and his outlook would change and by nature, so would his followers.. or some of them. Not because I have that power, but because true, authentic travel has that power. Travel is better than any self-help book or expensive seminar you can take, I promise. A guy like Charlie, 3 days tops and he’d see a difference. A week, forget about it. Life changed… forever. I don’t hate Charlie Daniels. On the contrary, I love the guy and the good he represents. What I hate is what he’s kind of become, which is a celebrity spokesperson for a political dynamic that spews divisiveness, bigotry disguised as political discourse, and xenophobia. America is better than that and so is Charlie Daniels. Travel is just a conduit to let the good beat out the bad. Lord knows I need it from time to time and by the looks of the discourse in this country, we all need it. Charlie – I don’t mean to troll you or pick on you and if it appears that way, I’m truly sorry. I really want your people to call my people (me) and let’s figure this out, my brother. Take a little break from touring and farming and let’s go on a little trip to rural Mexico, Honduras, Costa Rica, Haiti, Dominican Republic, etc., etc. etc. and meet some of the finest salt of the earth people on this incredible planet. What do you say, Charlie, want to go be a Tennessee Volunteer somewhere cool with me?